Webseries adaptations of beloved literary classics have been absolutely the sunshine of my life the past few months – like many people, The Lizzie Bennett Diaries is what initially pulled me in to the genre, then Kissing in the Rain made me happy, and it’s all history from there. Of the thousands of webseries on Youtube, my favorite are hands-down the literary adaptations, which have been seeing a huge boom in both creation and attention recently. They are five-minute interlocking episodes of romance, banter, combative chemistry, friendship, sisterhood, and a reworking of classic and loved characters into modern and immensely identifiable characters. Nothing not to love. Now, note that while I whole-heartedly recommend the top four, the other four are fun but flawed. I’m waiting with great expectation for future ones to debut to knock these down or off the list. I am not going to include The Lizzie Bennett Diaries because it goes without saying it’s my overall favorite (though NMTD is so close) and because I wrote it up here and am tired of talking about it. 1. Nothing Much to Do. God. I’m obsessed with this. Created by four New Zealand girls and performed by a large-ish cast of New Zealanders and one British boy, this is deliriously gripping and romantic for a webseries. It’s a loose modernized adaptation of Much Ado about Nothing in which Beatrice and Benedict are high school students who were good friends when they were much younger but drifted apart when Benedict acted like an idiot, and the two have hated each other ever since. When he comes back into town, the two immediately get off on a combative foot, to the dismay of all their mutual friends, who decide to convince each that the other is in love with them. There’s a lot more characters than in most webseries. There’s also a delightful looseness and flexibility to the filming – there are several group scenes and scenes in differnet locations, including ones set at a party, at the high school, and outdoors after a football match, which is really fun and makes the world feel more real. Also, there’s almost no monologues at all – nearly every episode has at least two people dialoguing and interacting with each other onscreen. 3. The New Adventures of Peter and Wendy I reviewed this exhaustively for Sound on Sight so I’m just going to link there, but this is quirky, charming, and has much higher production values and a more cohesive story than most webseries. It’as an adaptation of Peter Pan set in small-town Neverland, Ohio, with Wendy a columnist, Peter a comics writer, and Wendy’s brothers Peter and John as a ne’er-do-well slacker and John a neurotic editor. The set design is particularly gorgeous and Peter and Wendy are way too cute together. It’s also frequently funny – Brennan Manning as a hyperactive Michael and Lovlee Carroll as combative CEO Lily are scene-stealers. 4. Shakes. This was almost entirely overlooked when it came out in early 2014, partially because it came out before the big boom in webseries that followed The Lizzie Bennett Diaries, and partly because, at 12 episodes, it’s much shorter than most current webseries and didn’t have time to build up much momentum. Regardless, as far as plot, dialogue, and even filming, it’s of significantly higher quality than most. It’s a mashup of Much Ado about Nothing, Romeo and Juliet, and Hamlet, with Beau and Benedict as the main characters. The actors and characters are all in their early 20s and written with modern twists; Beau is the head editor and founder of a local newspaper, Benedict is a journalism graduate working as a lawyer, Romeo is a reckless adrenaline junkie, and Juliet is a kleptomaniac. Hamlet, meanwhile, is a stoner dealing badly with the death of his father, convinced that Ophelia’s father is responsible. There’s a beautiful adult confidence and tight pacing that’s missing in the looser, messier adaptations that make up the rest of this list, and I’d love to be friends with Beau and Benedict, they feel so real, the kind of smart, snarky, kind people you’d love to have in your life. Nothing’s wasted and all the scenes move the plot forward. Plus, it has the best kiss I’ve seen in all webseries except LBD. This would probably be even higher on the list except for the puzzling misstep of ending the Hamlet storyline with a very dark and tragic finale – I understand the pressure to stay close to the source material, but with so much else modernized in convincing ways and twisted to suit the medium and current story, why not change that also? Because Beau and Benedict are the main characters, this felt much more like a comedy than a tragedy, and the creators simply didn’t have the necessary number of episodes to properly set up what happened at the end. An odd choice. However the rest is fantastic. Also the actor who plays Benedict is 6 feet of dark-haired deliciousness. 5. Emma Approved. This should have been easily one of the best webseries on Youtube so far, and I am still bitter at how it underperformed its potential. But it’s well-shot, well-filmed, competently constructed, and Brent Bailey and Joanna Sotomura have great chemistry as Knightley and Emma (as they should, since they fell in love during the filming of and were boyfriend/girlfriend by the end). Just take my advice and skip through large sections of the first 30 episodes since it’s predictable and stale. Emma has been re-positioned as an event planner and life coach, with Knightley as her financial officer and business partner. One of the series’ great weaknesses was that almost every single plot event happened offscreen (and 50 episodes in, Knightley appeared in at most every other episode). Knightley and Emma had periodic sweet moments that light up the series, and a great ending, so it’s worth watching, just adjust your expectations, which are generally high for an Austen adaptation. 6. The Autobiography of Jane Eyre. This has an unassuming start – Alysson Hall who plays Jane is far too sweet to really capture the darkness and depths of Bronte’s complex character, but it comes into focus once Jane arrives at Thornfield Hall and Rochester appears. Jane is reinterpreted as a nursing student who drops out of grad school (my memory is a little hazy so I could be wrong on the nursing part) to go be a live-in nanny for Rochester’s ward Adele. At 95 episodes, it’s extremely long, and I liberally applied the fastforward button and skipping techniques in the first half. Jane and Rochester have really adorable bantering scenes together however – a much warmer, less combative relationship than in the book – and it’s definitely worth watching for those scenes, as well as the later ones with Simon who is unexpectedly adorable and charming. Fair warning however: after some really great romance including lots of flirting, scorching chemistry, a whole day off together which was a welcome addition to the story and really fun to watch, and a proposal, the actor who played Rochester had a a disagreement with the creative team and left – so we get only a tiny snippet of the final Rochester/Jane reunion (very odd – apparently even webseries have enough drama to cause creative splits). 7. Kissing in the Rain. This isn’t a serialized webseries but rather a series of loosely connected snapshots, in which two actors are cast in a series of projects and find themselves kissing over and over again, either in rain or to the backdrop of rain. They initially hate each other but gradually start to warm up. It re-creates kissing scenes from famous novels as well as a few original ones. It’s dizzyingly romantic and stars Sean Persaud and Mary Kate Wiles (Lydia from Lizzie Bennet Diaries). Other webseries I’ve seen (and didn’t particularly like): Kate the Cursed, A TellTale Vlog, Jules and Monty, University Ever After, etc. Ordained is also pretty dope! Great! 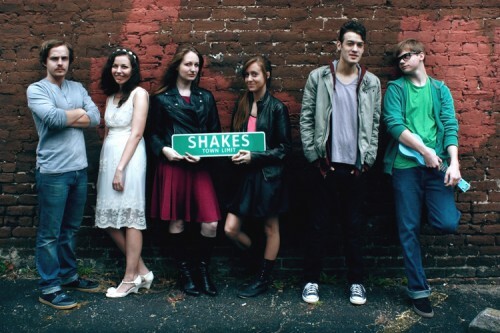 It started as a youth outreach program and using multiple teens in cast & crew! Have you checked out Always Lily yet? ?